Firstly, please check if one of my own creations (for example those shown here on my website) is available for purchase. I will be adding new (and removing old) items regularly. 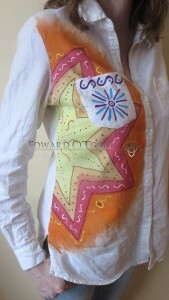 If anything catches your eye then please send me an email and I will give you further details about size, cost, etc. If you would prefer something done just for you then you will need to send me an item of clothing, a pair of trainers, handbag, etc for me to work on. It’s best if you send me something which you know fits you – it can be brand new or something old you want to breathe new life into (vintage or retro). Please first contact me by email so we can discuss what you want. Then you’ll need to send me a photo of what item you want painted so I can see what the working area is like. Next, you’ll need to choose a design style (abstract, nature or ethnic, or, if it’s an oil painting on a bag, we can talk about other options). Then you’ll need to specify the size and complexity of what you want done. This will affect the price. Once we’ve agreed on design and price, you’ll need to post me the item so I can begin working on it. You need to pay the whole amount when you send the item. PLEASE NOTE – I only work on natural materials. At present these are: cotton, linen, jute, hemp, canvas and silk. The material must be tight weave and not coated. I do not and cannot work with artificial fibres (polyester, rayon, acrylic, etc). It’s okay if your material contains less than 10% artificial fibre but any more and the paints won’t adhere to them. Generally, for a small or simple piece of artwork it will be in the region of 30 Euros. The larger and more complex the design (and the more complex the item I’m working on, e.g. around sides, over pleats, etc) the price increases accordingly. 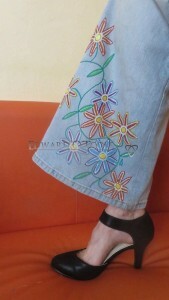 A painting such as that done on the Flower Flares will cost about 50 Euros. For those in Slovakia or the Czech Republic, I accept only Dobierka (or Paypal). For those living in the UK, USA or abroad, I accept only Paypal. Disclaimer – These paintings are not mass produced. They are each individually painted by myself. As such, sometimes accidents happen or they may not turn out as originally planned. I may even slightly change the design because of a burst of inspiration – sometimes the item itself wants a different design more fitting to it than the one originally planned. There’s also the possibility that the item could be damaged or destroyed. This is art, not a factory line. By sending me an item to be painted you agree that I have no liability if things don’t go as planned. I will do my best to make sure everything goes perfectly but there’s always the chance that it might not. You agree that we’ll both keep our fingers crossed and both come out happy with the end result but I’m not liable for anything whatsoever.